STI Motion Detector Damage Stopper 6.25"x4.0"x2.25"
Home > Facilities & Maintenance > Device Covers > Motion Detector Guards > STI Motion Detector Damage Stopper, 6.25"x4.0"x2.25"
STI Motion Detector Damage Stopper, 6.25"x4.0"x2.25"
Constructed of 9-gauge coated steel wire. Measures 6.25" x 4.0" x 2.25"
This super tough cage is extremely effective in reducing malfunctions and high maintenance costs where vandalism or accidental damage is prevalent. 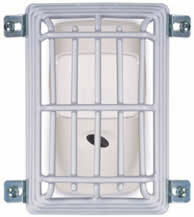 Unit is constructed of 9-gauge steel wire with corrosion resistant polyester coating. Does not interfere with the effective range of any protected motion detector. Recommended for areas where abuse to motion detectors is severe or continuous operation is essential. STI Motion Detector Damage Stopper, Corner Mount, 4.62"x5.37"x3"
STI Motion Detector Damage Stopper, Corner Mount, 7.75"x5.37"x5.62"
STI Motion Detector Damage Stopper, 7.0"x5.75"x4.5"
STI Motion Detector Damage Stopper, 8.75"x4.0"x3.75"